Bed bugs can make their home in your mattress and box spring or any livable areas of your home. They often feed at night, leaving little red marks on your skin. 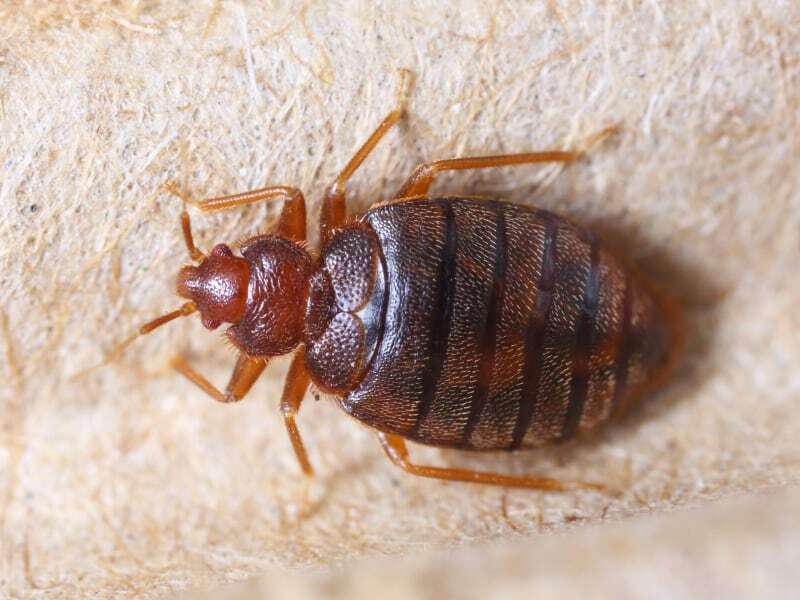 If you're worried you may have bed bugs give us a call. Our team will come out and let you know for sure. We offer the most advanced heat treatments available. Bee swarms and hives can post a risk to anyone, even if you're not allergic to their sting. The venom in a bee's sting, especially if there are many of them, can result in hospitalization. Bee nest removal is not for amateurs. Let our trained experts handle it! Bee's nests can be found in attics, crawl spaces, on eaves, in roofs, or exterior walls. Bee's can pose a hazard to families if they are allowed to remain. Let us get rid of this danger to your family, call us today. Black widows can be found outdoors in a variety of places. These spiders create webs to capture their prey. They can pose a hazard to families because they are often difficult to see in small poorly lit spaces outdoors. Removing black widows can be dangerous - let our experienced team take care of it for you. Black widows are often found inside people's homes. Regular inspection by trained professionals ensures these dangerous pests are identified before they pose a risk to your family. Contact us today. Cockroaches are one of the most common pests to share your home with you. They are prolific breeders and can spread disease. If you see these nasty visitors in your home, give us a call and we'll make sure they don't bother you again. A common sight in Arizona, crickets can be found insight or outside of your home. They frequently feed on other dead insects, plants, and food waste. While not dangerous, these pests are unwelcome house guests. Call us to make sure they never bother you again. Once a cockroach has found a comfortable place with a steady source of food (a kitchen, for example), they begin breeding and laying their eggs. These tiny roaches grow up quickly and become a nuisance like their parents. If you see baby roaches you've got a problem. Call immediately to make them go away! Relatively new arrivals to the Valley, roof rats can be found all over Phoenix. These pests can cause damage when nesting in your roof. Roof rats can also carry disease and should be removed quickly when identified. Let us send take care of this for you. Don't wait until they have chewed through your electrical wiring or phone lines. Roof rats often nest in the attics. These pests can make a real nuisance of themselves with the noise they make scurrying around. But more than annoying sounds, they make an awful mess. This damage is typical of a roof rat infestation. If you see this in your roof, contact us right away so we can get rid of your unwelcome house guests. Scorpions pose a threat to many households in Phoenix. These nocturnal predators are highly aggressive and will attack without provocation. If you see one, don't approach it. Give us a call and we'll take care of it. Scorpion stings can be extremely painful. If you've been stung by a scorpion you should seek medical treatment immediately. Scorpion stings can result in allergic reaction or become infected. Don't take a chance. Schedule your inspection today. Silverfish are found primarily in dark, damp places (such as kitchens or bathrooms). They're often identified by the damage they do to books or linens. If you see evidence of silverfish damage, schedule your service today. Termites are the nightmare of any homeowner. These desert pests can cause significant structural damage if left untreated. A good sign that you may have one or more nests on your property are termite tubes. These muddy tubes are visible on interior and exterior walls. If you see them, pick up the phone and call Budget Brothers Termite Department at once. Another example of termite tube damage to a house. This damage can often occur behind shelves and other wall units, blocking the signs for years. If you suspect that you may have termites, don't delay. Contact us immediately to have on of our professionals inspect your property. Wasps are a frequent sight during the spring and summer. These aggressive insects build their nests in out of the way places, typically on wooden surfaces. Quickly detecting these nests and destroying them is the key to eliminating the threat they can pose. Let our trained professionals handle it.